One time someone told me in a really convincing and authoritative voice that as an English major, it is really bad form that I claimed no interest in history. “All literature is history,” or maybe “All history is literature,” this person said and I shrugged and imagined maps and capitols and dates that wars ended and began and bad guys, borders and good guys, red buttons and paperwork, and blah blah blah. This has all sort of recently changed for me. I’m getting better at understanding the defining features of individual decades, both politically and artistically and especially fashion-wise. As this is all coming into focus, my fifth grade level of history knowledge. More and more every day I realize just how ignorant it sounds to say “I’m not interested in history,” which is not to say that “All literature is history” or vice versa isn’t a sort of pretentious way to chastise someone who simply isn’t into something. “Yes, pretty much,” he said, which wasn’t a satisfying answer to me then, and it really isn’t now. There were, of course, field trips to big buildings where men with briefcases explained how government works and pointed to portraits. But mostly field trips were just a chance to wrap a can of Dr. Pepper in tinfoil and worry about who your seat mate would be on the bus. Forget about college when I had to suddenly cram a history class into my schedule and the only one left was Ancient and reminded me of grainy movies that played on Sunday afternoons, men in loin cloths and flip flops brandishing swords. 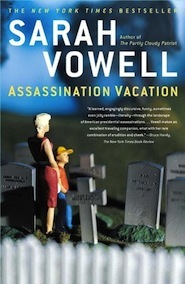 Cut to Sarah Vowell’s Assassination Vacation, a super readable, super entertaining, super funny series of road trips to even the most minute of landmarks tied to the assassination of presidents Lincoln, McKinley, and Garfield. Of all the geeky goodness. Vowell tours the land looking at chunks of brains, blood-stained tiles, visiting monuments and graves and considers the back history of the killers who were prompted by God or who otherwise assumed they would receive national glory for taking one for the team. And she pays homage to Lincoln’s son, who was either at the scene of the crime, or damn close, for each of these three murders. What a treat! This thought actually came into my head when I finished the first hunk of the book: Aw, nuts, I’m not ready to stop reading about Lincoln’s assassination. But then there was James Garfield, done in by Charles Guiteau, renowned for being so unlikable that even when he joined a community of free love frolickers in upstate New York, he was unable to find a willing sexual partner. Vowell is a free-flow story teller who can explain the political climate at a certain latitude and longitude and then segue into which ironic T her traveling partner is wearing. I’m not guaranteeing that I’m going to retain tons of what I read, but a few interesting facts here and there will come in handy as party tricks. Regardless, for the eight-ish hours it takes to read this book, Vowell had my full attention more than any other person who has attempted to spend eight-ish hours whispering history into my ear. I’m stoked to dig into her catalogue and see what other dead spots in my schooling that she can make interesting. I loved Assassination Vacation so much that when the audiobook was over, I went right back to the beginning and listened again. Have you read anything else by her? I am in love. I’ve read Partly Cloudy Patriot, which I really liked and the religion one. . . Wordy Shipmates perhaps? That I liked but not as much as Assassination & Patriot.